By Sidney J. Kurn, M.D., Sheryl Shook, Ph.D.
Healing Arts Press, 9781620555538, 256pp. Numerous medical journals have published studies supporting the use of herbs and nutrients in the treatment of neurodegenerative disorders. Yet in practice most neurologists rarely include them as part of their protocols. 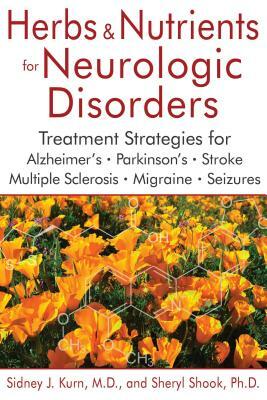 In this practical guide, Sidney Kurn, M.D., and Sheryl Shook, Ph.D., explain how to safely and easily incorporate herbs, antioxidants, and nutritional supplements into the standard conventional treatments for 6 common neurologic disorders: Alzheimer’s, Parkinson’s, multiple sclerosis, stroke, migraine, and seizures. For each condition, the authors provide detailed strategies supported by scientific evidence and years of successful clinical practice. They examine the biochemical role of each recommended herb, nutrient, or antioxidant and discuss potential side effects, counter-indications, and proper dosages to reduce symptoms, slow disease progression, and--in the case of stroke, migraine, and seizures--lessen the chances of recurrence. The authors explore the nutrient deficiencies and physiological mechanisms, including inflammation, heavy metal toxicity, and mitochondrial dysfunction, that can cause oxidative injuries and initiate neurologic disorders. They reveal which common substances, such as aspartame and glutamate, can trigger these mechanisms at the cellular level and recommend specific herbs and antioxidants, such as turmeric, cannabinoids, resveratrol, and N-acetyl cysteine, to counteract their effects. They discuss the importance of sleep to overall well-being, especially for those suffering from neurologic disorders, and offer tips to help ensure a good night’s sleep. Integrating neuroscience, biochemistry, herbalism, and decades of clinical experience, the authors lay the scientific foundation for a holistic, naturopathic approach to neurologic disorders and a way to enhance the quality of life for those suffering from these conditions. Sidney J. Kurn, M.D., has been a practicing neurologist since 1979, adding acupuncture to his practice in 1994 and herbal medicine in 1996. Now semi-retired, Dr. Kurn is currently studying physics at UC Berkeley. He lives in Santa Rosa, California. Sheryl Shook, Ph.D., earned her doctorate in neuroscience from University of California, Davis. She has completed studies in herbal medicine and currently is a sleep science and anatomy and physiology professor. She lives in Honolulu, Hawaii. "As Americans increasingly use herbs and nutrients to treat themselves for a wide swath of ailments, this kind of skilled advice, backed by rigorous science, is beneficial for general adult readership. VERDICT: All readers, including students and providers of integrative health care, will find this title to be a first rate resource."